Help us strengthen the rare disease community’s voice on Capitol Hill! 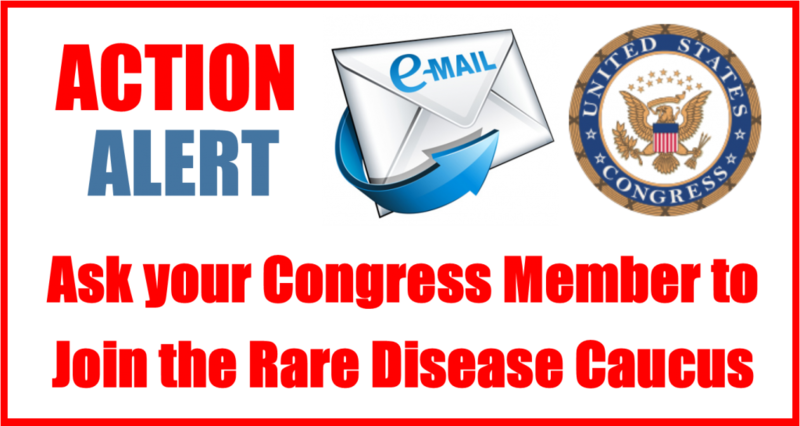 Please take 3 minutes to ask your Member of Congress to join the Rare Disease Caucus at bit.ly/Rare-Caucus. It’s easy – the Action Center has a draft letter that will automatically be sent to your Member of Congress – just put in your name and address & click send. We also encourage you to personalize the letter to share information about your specific disease. If your Congress Member is already on the Caucus the letter will automatically populate as a thank you letter instead – these are just as important to send! It can take up to 10 letters from constituents for a Member to respond so please share this Action Alert with your friends, family & colleagues. There are 435 Members in the House of Representatives – only 51 of them have joined the Rare Disease Congressional Caucus – 23 new members joined since our Lobby Day. A strong Caucus will enhance the Rare Disease Community political power on Capitol Hill. Help us reach our goal of 200 Caucus Members. The Rare Disease Congressional Caucus will help bring public and Congressional awareness to the unique needs of the rare disease community – patients, physicians, scientists, and industry, and create opportunities to address roadblocks in access to and development of crucial treatments. The Caucus will give a permanent voice to the rare disease community on Capitol Hill. Working together, we can find solutions that turn hope into treatments.